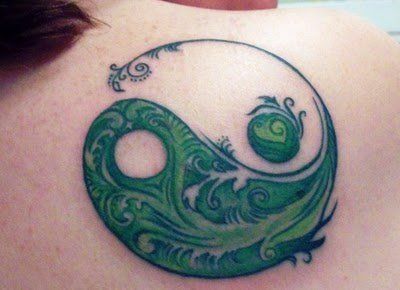 Yin Yang tattoos can be simple yin yang symbols or complex design that replace parts of the yin yang with flowers, dragons, koi fish or dolphins. 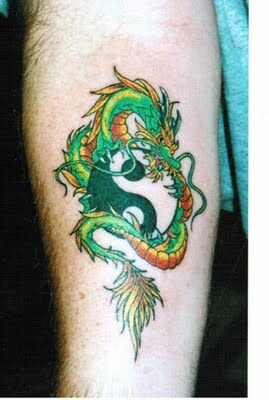 Simple designs consist of just the black and white yin and yang symbol, whereas more complicated designs will include symbolic design elements to create meaningful body art. 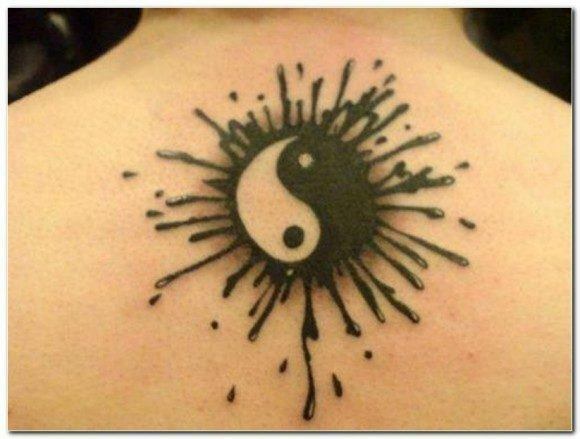 The yin yang (sometimes called the ying yang) is a Chinese symbol that represents balance. The name “yin yang” can be translated from Chinese into English as “dark and light”; two opposite forces that are represented in the symbol with the use of black and white. The dark and light halves of the design are separated with a curving line which divides the design in a natural, organic way. Each side of the yin yang sports a dot of the opposite color. 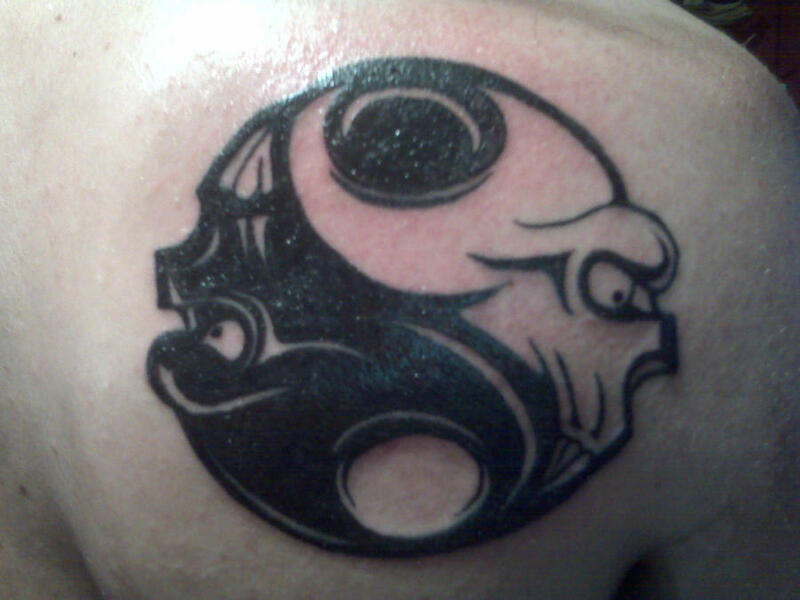 Yin yang tattoos represent wholeness through a balance of two equally powerful, opposing forces. These forces can be light and dark, good and evil, male and female or life and death, among others. Each of these forces is reliant on its opposite. Without one, the other cannot exist. For example, without day, there would be no concept of night. Without warmth, we could have no understanding of cold. Yin is the black side of the design, while yang is the white half. Wikipedia’s description of the meaning of the two halves of the yin yang is “Yin is characterized as slow, soft, yielding, diffuse, cold, wet, and passive; and is associated with water, earth, the moon, femininity and nighttime. Yang, by contrast, is fast, hard, solid, focused, hot, dry, and aggressive; and is associated with fire, sky, the sun, masculinity and daytime”. Although the yin yang symbol shows the two opposite extremes in harmony, represented by the colors black and white, the design doesn’t state that the middle point between these two opposites is important. If it were important, the color grey would have been used in the symbol to mark this neutral territory. In this sense, the yin yang is a symbol of either/or. In each half of the design there is a dot of the opposite color. This represents that a little bit of the opposing force exists in each side. In other words, a person can never be completely good – there will always exist in them the potential for badness, and a person who is thought of as being completely bad can’t possibly be pure evil – there is something in them, no matter how small, that is good. 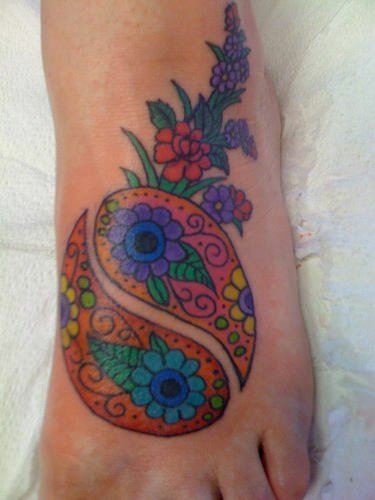 Yin yang tattoo designs are generally chosen by people who have a spiritual aspect to their personality. The ying yang symbol is an important part of ancient Chinese medicine, a central principle for many forms of martial arts and lies at the heart of Chinese science and philosophy. Because of its links to Chinese medicine and balance, the yin yang can be used as a symbol of health and physical harmony with the world. The symbol also represents the belief that all things are connected, and each thing or action has its opposite somewhere in the world. Circular designs are representative of the cycle of life and eternity. The curved line within the yin yang design creates a sense of circular movement. The head of one shape seems to be chasing the tail of the other, round and round in an eternal dance. This design feature symbolizes the eternal struggle within people to create and maintain balance within themselves. It is also a representation of time. Days chase after nights which chase after days in a tireless, cyclic journey through time. 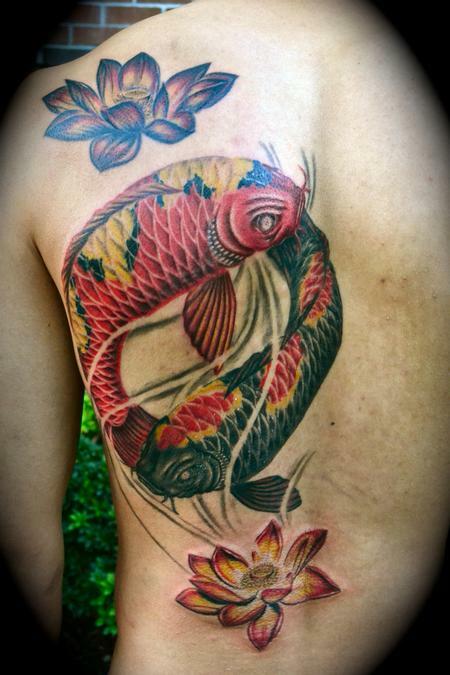 Yin yang tattoo designs often sport other Chinese and Asian elements, such as Oriental dragons, koi fish, lotus flowers, cherry blossom branches and Japanese waves. When used as part of a larger design, yin yang symbols are best displayed in their black and white format, to stand out against the rest of the design. 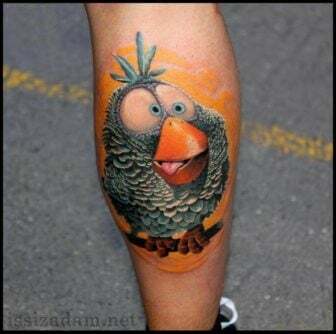 If the yin yang tattoo is worn on its own, it can be highly decorative, with each of the decorative elements symbolizing an aspect of the tattoo owner’s life.